Self-Publishing can be a very arduous task, especially for first-timers. 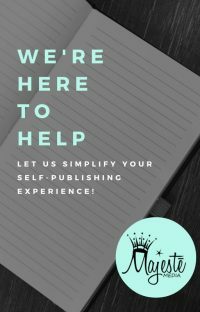 There’s so much to work out: content, editing, cover design, press releases, choosing a publisher, and more. At Majestē Media, we believe in bring simplicity to this process. We believe in handling the logistics so that our clients can focus on delivering the best possible version of their content to their target market. Are you ready to share your story with the world? Schedule your FREE consultation today!